At the Citadines on Bourke Melbourne you can stay in one of the many stylish studio, 1 or 2 bedroom self contained apartments that are available for short or long term stays in Melbourne. This modern furnished apartment accommodation is situated in the heart of the Melbourne CBD on Bourke Street, which places it close to Parliament House, Princess Theatre, Eureka Tower, Federation Square and all major business and financial offices in the city. Public transport via Melbourne's historic trams, trains or buses are easily accessible from the Citadines Melbourne Apartments, ensuring that guests can get to wherever they want to go without any fuss. When you stay at the Citadines Melbourne on Bourke Apartment Hotel you will have the privacy of your own fully self contained furnished apartment, as well as being able to enjoy the convenience of the hotel style facilities. Every apartment is fully furnished with modern amenities and has been cleverly designed to maximise space. The apartments feature unique kitchen designs, spacious living rooms, broadband internet access, air conditioning and heating, private ensuite bathroom, LCD TV, free Foxtel TV, DVD player, CD player and much more. After a hard days work or sightseeing guests can relax in the indoor heated swimming pool, sauna and steam room or make the most of the well equipped fitness centre. 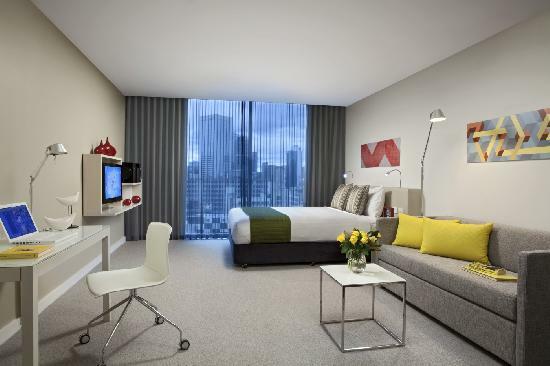 Staying at the Citadines on Bourke Apartments Melbourne you will be able to experience retail therapy at the nearby Bourke Street Mall, Melbourne Central and QV shopping precincts. You can also enjoy the cosmopolitan range of restaurants and cafes just a short walk away or visit the Melbourne Cricket Ground (MCG) and Rod Laver Arena for live sporting action such as the AFL, cricket, tennis and world-class concerts. Other attractions close by to the Citadines long term accommodation in Melbourne include Parliament House, theatre district, Chinatown, Southbank, Federation Square and the Victorian Art Centre.